The Grilluminator is great for night time grilling. No more putting on the spot lights and bothering the neighbors. You can grill, see what you are doing, and not light up the whole world to do it when you want to have a late night BBQ with the family. Where was this years ago. My husband did most of his grilling at night after work which meant at about 1:00 AM in the morning. My husband is really loving this light and has said how helpful it is. Easy to install and use with a great guarantee. 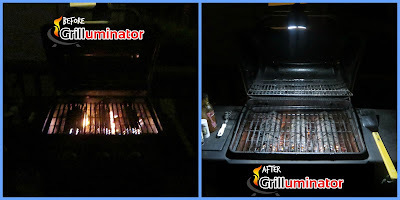 What Grillin and Chillin has to say about their product.